Intertops Sports is dishing out a huge $10,000 Super Bowl Prize Draw for all you US sports fans, no matter what team you bet on! This is a win/win situation; there’s no way you lose with the Super Bowl Prize Draw, only win! And that’s because you don’t have to spend hours analysing stats and figures of each team, just bet on ANY market for the Super Bowl LI and collect a share of the cool $10K Super Bowl Prize Draw. Intertops Sports is giving out $500 Free Bet prizes to 20 lucky players that wager on ANY of the Super Bowl LI markets – this includes both pre-game and live bets on the final game. You can place wagers on a wide range of betting markets, so there ain’t a lack of options to choose from for the special event. TIP: The more your wager from now until the very end of the game itself, the higher your chacnes of entering the exclusive draw and winning your piece of the action that’s worth up to $10,000 with the Super Bowl Prize Draw. The Atlanta Falcons are viewed as the underdogs for Super Bowl LI, and for good reason, having reached the Super Bowl only once prior to this season, way back in 1999. However they lost Super Bowl XXXIII to the Denver Broncos 34-19, so they’ll be looking to give their all against the New England Patriots on February 5, but we’re predicting they’ll come up short against the four-time Super Bowl champions. Bet on the game itself (pre-game or live) on any of the markets offered by Intertops Sports; you can choose from Game Lines, 1st Half, 1st Quarter and Outright. Check out the ‘NFL Game Props’ section of the site for some interesting Outright bets to win the 10K Super Bowl Prize Draw! Intertops Sports is the go-to US online sportsbook that is famous for offering great bonuses and promos for US sports betting players; the Super Bowl Prize Draw is only the latest offer in a long list of bonus deals. 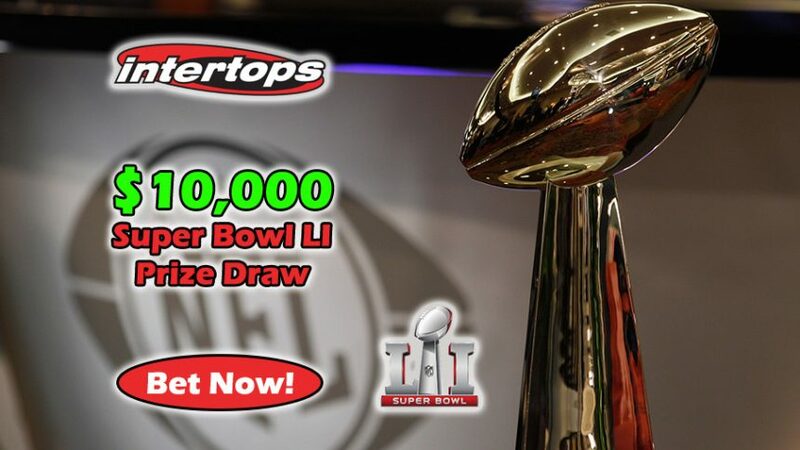 Join Intertops Sports today and start betting on absolutely any market for the Super Bowl LI, and you could be getting your hands on piece of the Super Bowl Prize Draw that’s worth a huge $10K! Celebrate together with the champions on February 5 with the Super Bowl Prize Draw!